Join Nelson Handbells and the nation. Ring a bell and celebrate the opening of the Olympic Games. 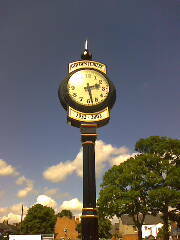 We will be by the Golden Jubilee Clock in the centre of Borrowash, Derby from 8.00 am on Friday 27th July. We are in good company as Big Ben will also be bonging at the same time. www.allthebells.com/ for more information on the event . When the 3 minutes are up we will play a few pieces on a theme appropriate for the occasion and hope to collect a few pence for Treetops Hospice.